Where the rural side of Wakayama gave birth to a culinary heritage resonating far beyond its borders. It is hard to imagine Japanese food without soy sauce (shoyu). Located 40 mins by train from Wakayama City is the birthplace in Japan of this salty tamari-based condiment. The town of Yuasa is known for its well-preserved townscape, and for its tradition of craftsmanship. Step out of the modern world to enjoy the taste of soy sauce unchanged from feudal times. Throughout Wakayama, preserved foods are a vital part of the traditional local culinary repertoire, one highlight of which is the regional specialty Saba-no-narezushi made from salted, fermented chub mackerel. The Arida, Yuasa, and Hidaka areas are also known for grouper (kue) and spiny lobster (ise-ebi), both seasonally at their best in Autumn. Another highlight is the surprisingly light-flavored yet fatty white-fleshed fish, cutlass (tachiuo). In addition to the shoyu made in Yuasa, this area is also famous for Kishu Binchotan, which is a fine, white charcoal. Its slow-burning properties when delicately grilling items such as freshwater eel (unagi) brings out the umami (savory flavor). The Ubamegashi Tree from which Kishu Binchotan (white charcoal) is made, is the approved symbol tree of Wakayama prefecture. Wakayama’s prefectural flower is the ume plum blossom; Minabe Town is the best place to view them. Ume orchards filled with tens of thousands of ume trees line both sides of the river. In late Winter and early February, when the flowers bloom, the sweet fragrance wafts as far as 40 km away. The salted-ume pickles (umeboshi) that hail from this region are the most acclaimed in Japan. Umeboshi is a serious affair in Wakayama; there is even a museum dedicated to the humble apricot-like ume fruit in Hidaka City. As Japan’s leading producer of fruit year-round, Wakayama’s selection of fresh produce is always within easy reach. 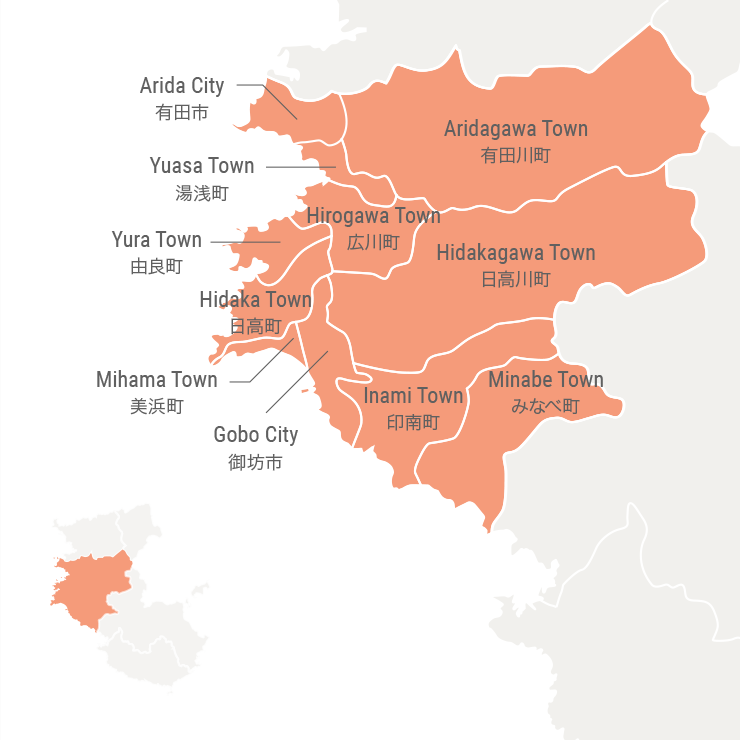 Arida, Yuasa and Hidaka areas have many orchards; why not try your hand at making homemade ponzu (a citrus-based dipping sauce) or even picking choice fruit, like the famous mandarin oranges (mikan) named after Arida Town. Aragi Island is off-the-beaten path, but for nature lovers the site of its historic lush rice terraces may make the extra effort well worth it. In recent years, the fan-shaped terraces are lit up on the evening of September 6th with thousands of LED lights. Wakayama abounds with scenic spots, from mountainous landscapes to uninhabited islands. The Shirasaki coast, and its limestone formations is another spot in the region that stands out for its expansive view over the Pacific Ocean.